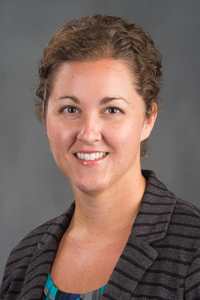 BLOOMINGTON, Ill. – Illinois Wesleyan University Assistant Professor of Nursing Lydia Bertschi has been selected as a recipient of the 40 Under 40 Emerging Nurse Leaders Award from the Illinois Nurses Foundation. Bertschi is the third member of the School of Nursing faculty to be chosen for this honor, now in its third year. Winners were chosen by a panel of their peers based on their achievement in the profession, leadership, and community and association involvement. A 2005 graduate of Illinois Wesleyan’s School of Nursing, Bertschi earned a Doctor of Nursing Practice (DNP) at the University of Illinois at Chicago. Her previous work includes nursing in critical care at OSF St. Joseph Medical Center in Bloomington, and in pulmonology and intensivist services at UnityPoint Health – Methodist. She has been active in humanitarian and medical relief for Haiti since 1998, serving as volunteer medical team coordinator for Hospital Lumiere in Bonne Fin, Haiti, since 2013. She is currently researching the identification of cardiovascular risk factors through health screening clinics at a rural Haiti hospital. This research will provide transformational research opportunities for IWU nursing students, said Vickie Folse, School of Nursing Director and Caroline F. Rupert Endowed Chair of Nursing, in recommending Bertschi. "Dr. Bertschi’s ongoing commitment to expanding her research internationally as well as involving undergraduate students in her research strongly positions her to be a leading nursing scholar that will impact current and future generation of nurses," Folse said. "Her selfless service also serves as a model of interprofessional collaboration for our students." Bertschi is a member of the Phi Kappa Phi Honor Society and the American Association of Critical Care Nurses, and serves as Vice President of Sigma Theta Tau International Honor Society of Nursing, Theta Pi Chapter. Previous recipients of the 40 Under 40 Emerging Nurse Leader distinction at Illinois Wesleyan were assistant professors of nursing Ann Eckhardt (2016) and Amanda Hopkins (2015). This year's winners will be honored at a Sept. 14 event in Chicago.